To be successful, every CFA candidate needs a good study plan. Setting deadlines for the topics is the first step. A conventional one. But how about a somewhat unconventional approach which – apart from arranging your CFA prep calendar – takes care of your knowledge retention? Firstly, we definitely need to differentiate between a conventional and an unconventional approach to planning the CFA level 1 exam preparation. To do that, we must specify the basics of the conventional way. Study topics one by one according to the CFA Curriculum sequence. Focus on one topic at a time (go back or forth to other topics sporadically, only if needed). Revise the whole study material after dealing with all the topics (usually, it’s the last month before the exam). As any organized study rhythm, it enables systematic learning and allows good preparation. It makes you focus on one topic before you move on to the next. There's a lot of time left at the end of your exam prep planned for revision. In special circumstances, it may act as a buffer against failure to study all the topics. You may choose to devote less time to revision. This is how you reduce the risk of failing to cover the whole study material. If for a couple of months you study topic by topic and you revise the material only in the last month before your exam, you completely ignore one thing which is extremely important from the perspective of a learner. This thing is forgetting curve. 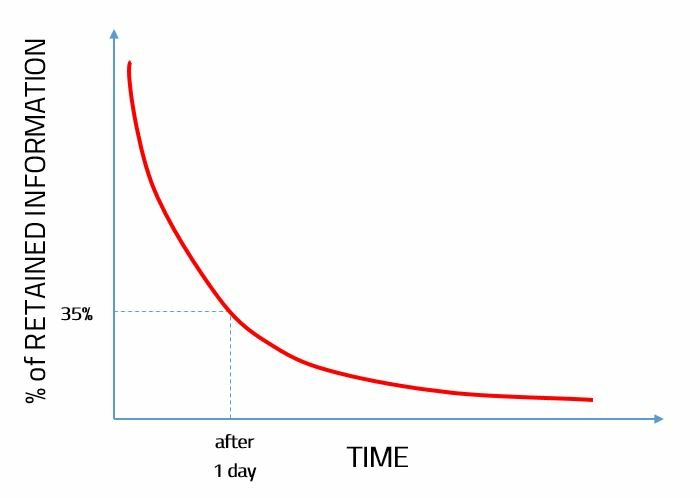 The forgetting curve – which is shown in the graph below – makes us realize that the retention of information drastically decreases as time passes. How to improve your knowledge retention? Develop ways to actively put yourself in touch with what you’ve already studied. Do tests, watch videos, write index cards & stick them around, use flashcards, read summaries of the study content, take notes. All this on a regular basis! It helps you retain the most crucial information as it systematically challenges your memory. It comes as no surprise that it is better for you to revise more often for shorter time spans than to have one long revision just before the exam. Bearing all this in mind, we put forward an unconventional alternative to CFA level 1 exam prep. Reorganize the CFA topics into the optimal sequence. Plan plenty of short revision sessions all throughout your exam prep. When revising topics, accumulate the revised material by going back also to the previous topics (even if just for a while). Read and reread Ethics throughout the whole preparation period. Do many exam-type questions to get familiar with the form of your CFA exam. Secure some time for a proper pre-exam revision. Do as many mock exams as possible before your exam. Some CFA topics are more important and/or difficult than others. You don't want to neglect the most important and the hardest level 1 topics. You best remember what you studied just after you studied it. If you review the material on a daily or weekly basis, you react against the detrimental impact of the forgetting curve. Topics are often correlated with each other. By reviewing them in groups, you can see this correlation, which enhances your learning and understanding. Plus, once again, you show some respect for the forgetting curve. Ethics is one of the top topics, not only in the level 1 exam but also as the whole CFA certification is concerned. That's why there's ethics adjustment. Getting used to the form of CFA test makes you more confident on the exam day. It's a boost that can often decide about your success. Even if you revise on a regular basis, a proper pre-exam revision is a must! Why? See no. 7 below. It's too risky to leave mock exams for the last week before your exam. You should do as many mocks as possible over the last couple of weeks before the exam. Worried that you haven't dealt with all of the topics yet? Well, you can still fight against time but also make sure you get enough practice. The topic sequence applied is not random. More challenging topics are coupled with more easy ones allowing you to take a sort of a break meanwhile. Also, where possible, topics are coupled based on the similarity of concepts. Last but not least, the most important topics - i.e. Ethics and FRA - are scheduled relatively upfront to ensure they are thoroughly studied. You are asked to focus on your weekly tasks, including both CFA readings and review sessions (to have regular review scheduled go for the full version of your study plan). To aid your revision, there are free & paid tools available inside the app. There are 4 topic revision sessions, each accumulating topics into groups. This way the topics covered first are revised most often while the topics covered just before the exam are revised once (you should remember them well enough plus their exam weight is the lowest). Ethics is treated exceptionally. It’s scheduled at the beginning and at the end plus you’ll be asked to study Ethics Standards also in between other topics to learn them thoroughly. Inside your Free Study Plan, you will find some free exam-type questions. And even more of them in the paid version of our app. It all wraps up with a proper Final Review! Its length is proportional to your whole CFA exam prep. During the Final Review, some revision tasks are suggested to you such as mocks or formulas review (use our Test App or Formulas App, respectively). Below, you will find a sample 4.5-month CFA level 1 study plan that follows all the above-mentioned assumptions. Moreover, you can have your own personalized study plan, with your own deadlines but the same study planning approach. NOTE: If you create your study plan as of 28 January 2019, your deadlines will be as stated in the table. If you set up a study plan at a later date, the deadlines will get adjusted. Editor's Note: In winter 2018, this post has been updated for accuracy and comprehensiveness. What do you mean by revision? What should we be doing during that time?